I really don't like the pre cyclops headlight so, i'm going to swap a 98 gsxr headlight into it, i hope . After getting some measurments, i think it can be done. It,s going to be a hand full of welding, cutting and molding, I'm looking forward to see how it works out. If it doesn't look the way i hope, I may use an earlier gsxr headlight. Not a fan of the dual setup on them though. Reminds me of the dual setup in the Harley fairings. Last edited by 92xjunker; 03-31-2013, 12:12 AM. I've seen it done with the older GSR 750 headlights. There is a set forsale in the classifieds. Goodluck with the new set and hope it works for ya. You do know they make one, for a Katana you can bolt right on right? Good call Chris! Personally, I think that would look sharp! I'm not to interested in the dual exposed lamp look. besides that it's already been done by someone else. really want my own look. Unless i could retro into the pre housing. that would leave me with the same cyclops look. 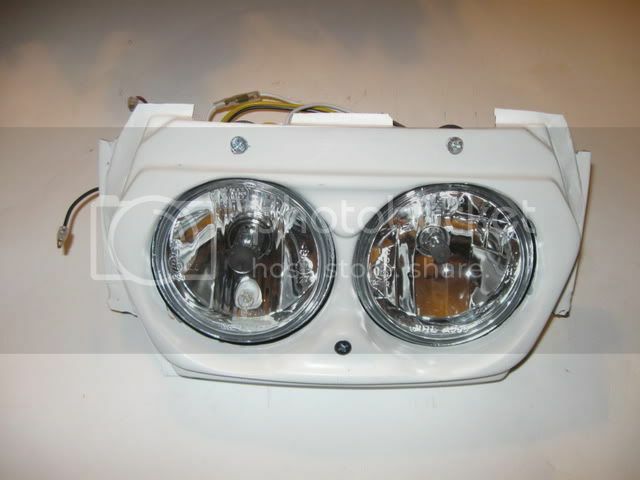 The 98 gixxer light is more recessed into the fixture and has a clear, cleaner lens. we'll see might go with that seup if it gets too complicated or not cost effective to use the 98 gixxer light. Input is greatly appreciated, gives me things to think about. Last edited by arsenic; 01-08-2012, 03:51 PM. Now thats modding with style....great job. You're bike is pretty old school. I'm not sure how modern and old school would work together. Post photos of the progress, I'd love to see what you have in mind. That old school dual is ugly as ****.